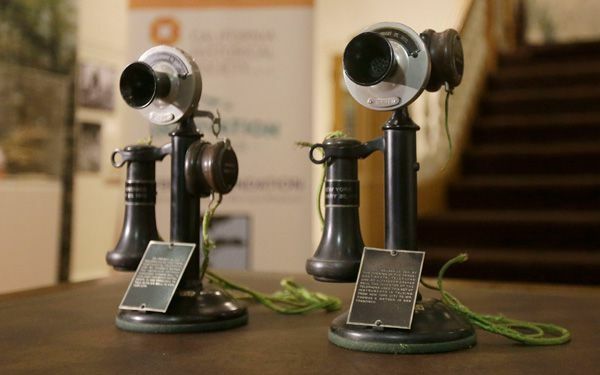 The original phones will be on display at the California Historical Society as part of its "City Rising: San Francisco and the 1915 World Fair" exhibition. It opens on Feb. 22. That first call was made by Alexander Graham Bell in New York. He called his assistant, Thomas Watson, who was attending the World's Fair in San Francisco. Bell had invented the phone a few decades earlier. The call actually lasted about 3 1/2 hours. They kept the line open for a series of conversations. And unlike today, there was no such thing as unlimited talk time for a set price. The cost of a three-minute coast-to-coast call in 1915 was about $20. That is about $500 in current dollars. Hartig said Bell was a visionary. He wanted to push technology as far as possible. "I think that he would be delighted and amazed to think that we have the world in our palms," she said. "I think he would be right there with us texting and walking and hopefully not driving." It's crazy how smartphones became more accurate over the years. No one expected that smartphones would be so popular in this century. Only 20 years ago, it wasn't that common that people had phones. I think from phones from that era, we have come along way. We used to have giant phones then small phones and now we are going to the giant iPhone 6 plus. We also have unlimited nationwide calling and text so they had it tough then for twenty dollars from San Francisco to New York. I have a great aunt that lives in New York and my grandma will call there for free and chat for twenty minutes at a time. Three and a half hours though, it makes sense for that long. It is really expensive to call for only three minutes and pay $500! There must not have been that much of technology in 1915. I think that the telephone was a great invention. Today, someone was able to take a picture on their current phone of the phone that called the first coast to coast call 100 years ago. The call was from New York to San Francisco and it lasted for about 3 1/2 hours because they kept the line open for multiple conversations since it was such a new thing and big deal. The rate of a 3 minute call back then was about $20 which is the equivalent to $500 dollars today. I think it's really cool to see the comparison of where humans were exactly 100 years ago, just being able to call coast to coast, to today where we can do almost anything on our smart phones. Ironically, a smart phone was use to take a picture of the first phone to make a coast-to-coast call. 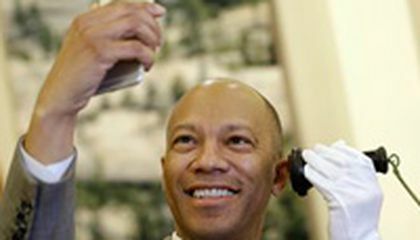 The phone will get put on display at the California Historical Society. In 1915, a coast-to-coast call cost $25 and as of today, it costs $500. The first coast-to-coast phone call lasted three an half hours long. I think that it's a great idea to put this phone on display because phones are a major part of daily life almost for anyone. Reading this article definitely helps me realize our society today and how far we've come. We have lightweight pieces of technology that contain so much information that if you think about it is incredible. With phones you can call or text someone from a different country and its free. Like Kristin Bender informed us, "...we have the world in our palms." I don't think we realize it but our society is able to do so many things that once seemed impossible, and we are still growing. Someone was able to take a picture on their smart phone of the phone that called the first coast to coast call 100 years ago. The call was from New York to San Francisco and it lasted for about 3 1/2 hours. The rate of a 3 minute call back then was about $20 which is the equivalent to $500 dollars today. I think it's unbelievable how much has changed over 100 years. In about a hundred years, we've gone from a huge dial up telephone to an iPhone 6 plus. What has changed? Evolution. Back then it cost $20 to call from the west to the east coast, equivalent to about $500 nowadays. With our iPhones, we don't have to pay anything besides our monthly bill which is under $50! Unlimited texting, unlimited calling, but back then, they did have that. So many miles of wire that had to be connected from east to west all for one phone call, which led us to modern day phones and iPads. In response to the critical thinking challenge, quoting from the article, "They kept the line open for a series of conversations." , most likely because of the experiments importance. It's kind of weird to take a picture of phones from 100 years ago. But I guess because I wouldn't do it because its not what most teenagers would do.